Gift-giving and many other Christmas traditions commemorate the birth of Jesus Christ, but also involve excitement for children, heightened economic activity, and a bright holiday with bright decorations highlighting the year. No wonder Christmas is scheduled near the Winter Solstice; it helps people get through dark Winter days with shortest daylight. Use of early forms of the word Christmas occurred in 1038 AD. In modern times Christmas refers to a Christian festival celebrating Christ’s birth. My own dog gone commercial. I can’t stand it. Facebook has moved into people’s private and social lives, and has managed to combine advertising with social connections. With the modern emphasis of consumerism on Christmas, Facebook has become a strong player during the holiday season. Facebook is affecting people’s attitudes, psyche, and product selections; just as Facebook has affected sharing news media reports. Facebook entices people to make decisions between individual privacy and social acceptance, and involves a drive for popularity with the main side effects of narcissism, greed and envy. People who are struggling with their own lives and succumbing to negativity are likely to become more critical online. With Facebook, these people have plenty of platform to project their negativity. They might look for a chink in your armour, or pull you down if they perceive you are climbing too fast. Cyberbullying has become a serious threat, especially regarding teens and teen suicides. When people initiate negative comments online, especially on Christmas Eve or Christmas Day, they’re really admitting that they perceive their own lives are overpowered by negativity. Would a successful CEO, celebrity, musician, or business manager waste their time, and sit down on Christmas Eve and dish out criticism on a computer? If they did, you would probably worry they’re having a break down. Most people who have difficulty overcoming negativity in their own lives are going to want you to fail, especially when you start succeeding. They may not not know why they want you to fail, and they might not even ask themselves why, but their basic instinct is to want your work, your life, your relationships to fall apart. They incorrectly think that criticism will somehow improve their lives in some undefined road to success. Take a look at the comments at the bottom of news stories or YouTube videos. The comments sections are often loaded with commenters who attack each other or attack the media agency that published the media. They are loaded with much vitriol. You will see a bunch of people predicting failure, throwing personal attacks, and then investing energy toward their negative comment. Sometimes they haven’t even read the article carefully and they are arguing about nothing. Sometimes the comments over-react to a typo or a choice of trigger words that counter the negative commenter’s ideology. Negative comments are often fueled by racism, sexual identity and political identity. These things are the polar opposite of the Christmas message. Negative people like pointing to the failures of others, probably for their own comfort zone with their own failures or frustrations. They might be stuck in their own rut for a job. They might think, “How dare someone else try to fix themselves, and rise above the rules of the ordinary.” That’s not goodwill. That’s not the Christmas message. Instead of becoming a victim of negativity, you have to choose to either take command and help the person, or get away from the person. You might even have to shut down your news consumption, or Facebook altogether for a time period. During the holidays, mental health experts recommend people avoid excessive rumination about their lives, and focus on thoughts of the good things about Christmas — goodwill, loving, kindness, and generosity of spirit, not material. Christmas chronologically is the follow up to Thanksgiving, while naysayers are quick to claim that Thanksgiving has nothing to do with religion. But gratitude is key to Christmas joy. Changing greed back to gratitude is an important part of enjoying Christmas, but some find that focus difficult with the barrage of TV ads for the gifts of luxury cars and other products in idyllic life situations. Charlie Brown Christmas, Charlie Brown Warner Home Video. 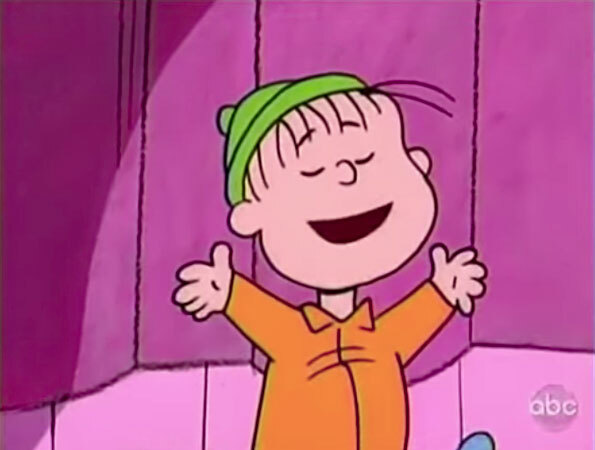 “…That’s what Christmas is all about, Charlie Brown. Negative haters attempting to bring down others have been around a long time, and it wasn’t long after the gift-bearing three wise men Melchior, Caspar, and Balthazar arrived in Bethlehem, that trouble started with Jesus. Herod, client king of Judea, ordered the killing of nearby male infants, hoping to kill Jesus, and prevent the rise of a new King of the Jews. The story of Jesus of Nazareth, documented in the Gospels, also reports the negativity Jesus faced. Did the negative hometown crowds that Jesus faced have a special jealous streak, or were they just general skeptics? In the Gospel of Mark, there is an account of a visit by Jesus to his hometown with his followers. When Jesus begins to teach at a synagogue, the hometown crowd who heard the teachings were astounded and offended, asking “is this not the carpenter, the son of Mary?”. It adds that he could do no ‘deeds of power there’ except heal a few sick people. Amazed at the community’s lack of belief in him, Jesus observed (according to Mark 6:1-6) that “Prophets are not without honour, except in their hometown, and among their own kin, and in their own house.” Without the double negative language that means, Prophets have honor, except in their hometown, among their family and at their own house. “Where did this man get these things?” they asked. “What’s this wisdom that has been given him? What are these remarkable miracles he is performing? Isn’t this the carpenter? Isn’t this Mary’s son and the brother of James, Joseph, Judas and Simon? Aren’t his sisters here with us?” The crowd was offended by his words. They noted Jesus could not do any miracles there, except lay his hands on a few sick people and heal them. Jesus was amazed at the hometown crowd’s lack of faith. Some believers claim that the proverb “Physician, heal thyself” are words with other insults that Jesus heard while hanging on the cross during the crucifixion. “Physician, heal thyself” is interpreted as mocking Jesus for not using his power to come down from the cross himself.